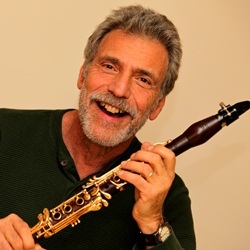 Prolific American musician and Grammy Award winning jazz clarinetist Eddie Daniels appears in association with the weekend festival Clarinet Spectacular*: Jazz Meets the Classics. Join Daniels, Ohio State clarinet professor Caroline Hartig, and the Ohio State Jazz Ensemble under the direction of professor Ted McDaniel. Dr. Hartig and Eddie Daniels will perform a classical duo for two clarinets, Il Convegno Divertimeto by Amilcare Ponchielli. The jazz portion of the program will include selections from the following: A Concerto In Swing, Patrick Williams; Thad Said No and Under The Wire, Gordon Goodwin; Quietude and Mornin’ Reverend, Thad Jones; and I Fall In Love Too Easily, written for Eddie Daniels by Paul Ferguson. FREE to all Concert Card holders and to Ohio State students, faculty and staff (1 ticket per BuckID presented in person; subject to availability). Advance tickets may be purchased from the Ohio State Theatre Box Office. Visit the box office at the Drake Performance and Event Center, 1849 Cannon Drive (2nd floor), or call (614) 292-2295, Monday-Friday, 10 am–4 pm. All major credit cards accepted. Tickets will also be available at the door, one hour prior to the performance (Weigel box office accepts cash or check only).